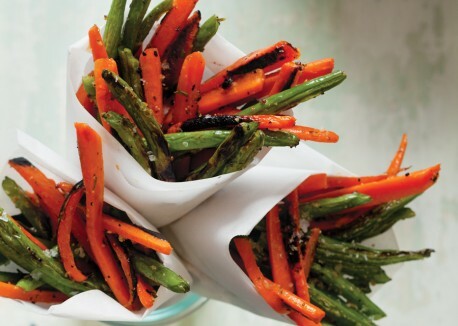 Rosemary-Garlic Carrot and Green Bean "Fries"
1 . Preheat oven to 425°F. Lightly grease two baking sheets with oil. 2. Stir together 2 Tbs. oil, 1 Tbs. rosemary, and 1 Tbs. garlic in large bowl. Season with salt and pepper, if desired. Add carrots, and toss to coat well with oil and seasonings. Spread carrots in single layer on one prepared baking sheet. 3. Combine remaining 2 Tbs. oil, 1 Tbs. rosemary, and 1 Tbs. garlic in same bowl, and season with salt and pepper, if desired. Add green beans, and toss to coat. Spread green beans on second prepared baking sheet. 4. Roast green beans and carrots 20 to 30 minutes (depending on thickness), or until vegetables begin to turn deep brown in spots. Season with sea salt and pepper, if desired. Cool 2 minutes, then serve, or cool on baking sheets, and serve at room temperature.